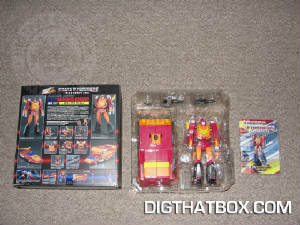 Pictures 1-3: The packaging is larger than both original toys' boxes combined, retaining the matte black finish with gloss photo of the Masterpiece line. 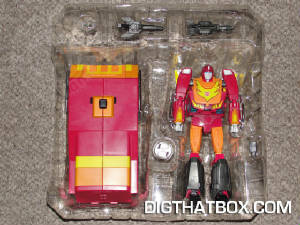 The oversized clear plastic bubble holds Hot Rodimus, Trailer and accessories in place. 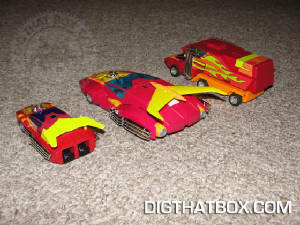 Picture 4: Right out of the package, Hot Rodimus (and Rodimus Convoy) can hold both the welder and saw blade. Rotating the "ears" on the helmet brings down the visor. 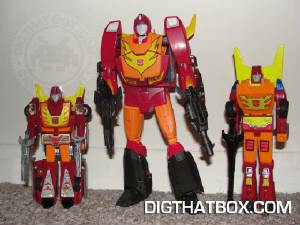 Pictures 5-7: Hot Rodimus is much more cartoon accurate than the Hot Rod toy inspired by the 1986 movie. Key items include the a more accurate head and (finally) some real boots. Like the other masterpiece toys, the robot mode rivals even the best statues. VERY well done! 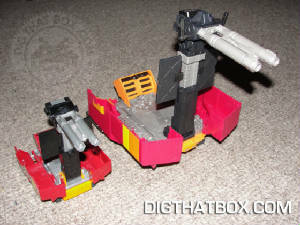 Pictures 8-9: The chest can open, which allows a mini matrix (included) to be inserted. 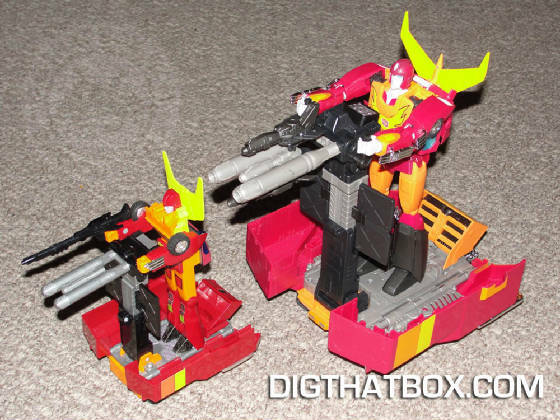 Pictures 10-11: Hot Rodimus' guns push together to form Rodimus Convoy's Rifle. For such a simple transformation, the effect is incredibly effective! 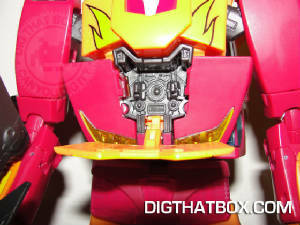 Picture 12: Transformation to Rodimus Convoy involves several very subtle changes including flipping the Rodimus Convoy face out from under the Hot Rodimus face, pulling up on the neckplate, pulling down the legs and arms and squeezing the spoiler tips closer together. That's it, yet it becomes obvious that this is no longer the young soldier we started with. 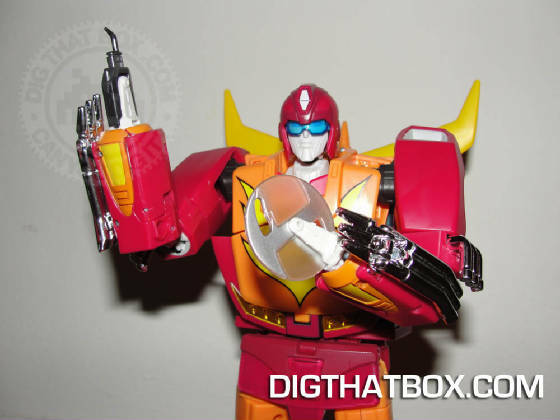 Again, this is FAR more cartoon accurate than Rodimus Prime. 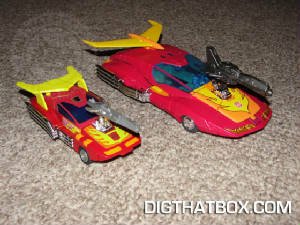 Pictures 13-15: The Trailer transforms virtually identically to the G1 Rodimus Prime trailer. 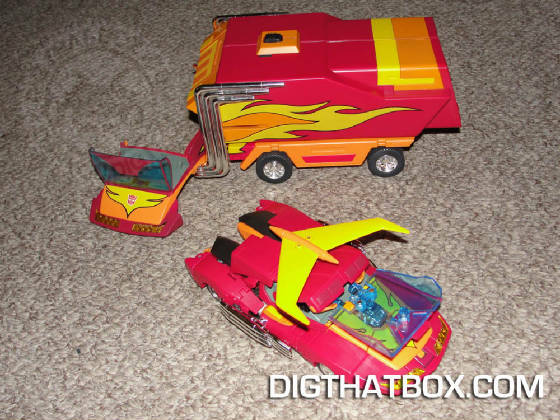 Only real differences include hinged flaps (instead of plug-in), flip-up display, integrated handles and the ability to hold Hot Rodimus' guns. 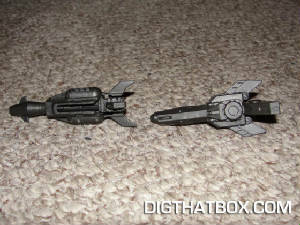 Picture 16: Battle Mode is bigger and badder than before! 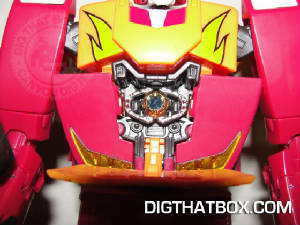 Pictures 17-18: Transformation is very involved and very fiddly. 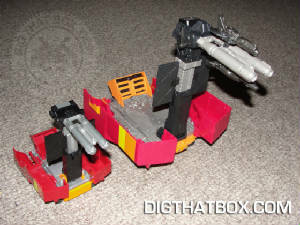 Legs become the rear of the car, feet end up under the cockpit, chest expands to become the front, arms (and even pipes) transform into the sides and the backpack unfolds to cover the top and rear of the vehicle. 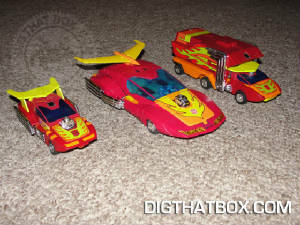 Hot Rodimus' vehicle mode dwarfs Hot Rod and Rodimus Prime. Very cartoon accurate, although fiddliness of the transformation can make rolling on flat surfaces difficult. 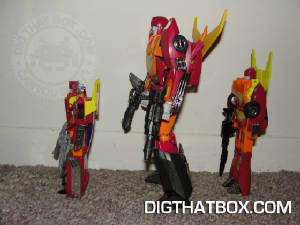 Pictures 19-20: Hot Rodimus can hold his gun in his engine, just like Hot Rod could. 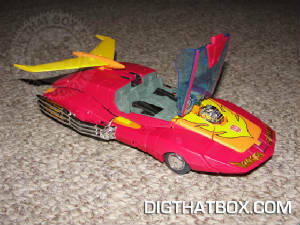 However, the canopy opens; a trick the G1 toy couldn't hope to match. 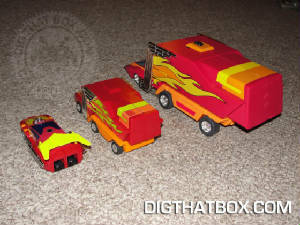 Picture 21: To transform into Rodimus Convoy's vehicle mode, the front unfolds from underneath the trailer. 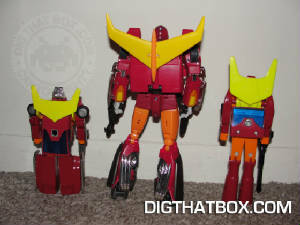 Hot Rodimus' canopy and backpack reconfigure to fit under the trailer. 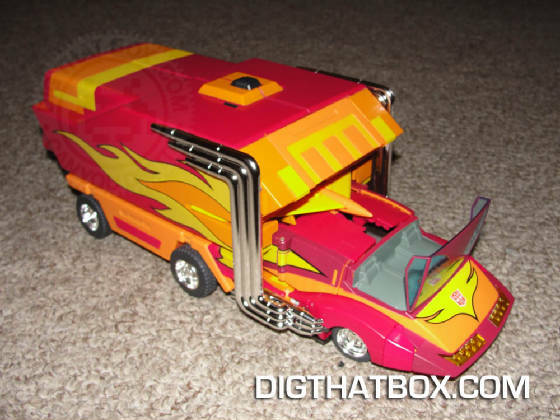 The rear of Hot Rodimus will become the front of Rodimus Convoy. 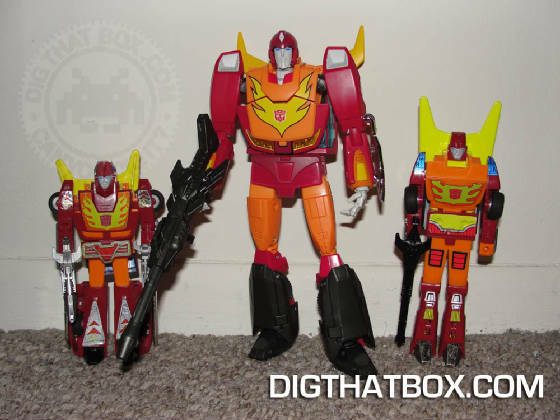 Pictures 22-23: Rodimus Convoy is simply gigantic compared to Hot Rod and Rodimus Prime. Very well done, although the roof of the cab doesn't line up very well due to the nature of the transformation. 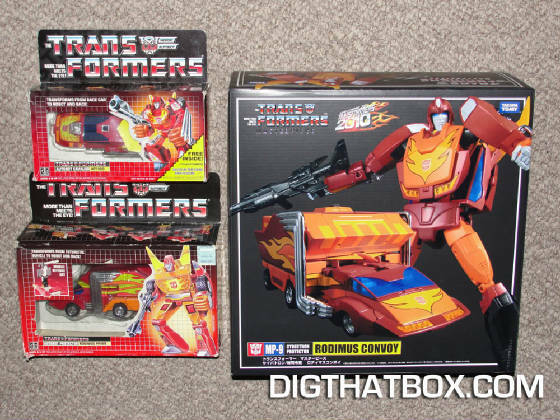 Picture 24: As with Hot Rodimus, the canopy of Rodimus Convoy also opens. 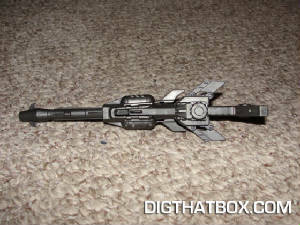 This is an amazing feat of engineering, being cartoon accurate in all modes. 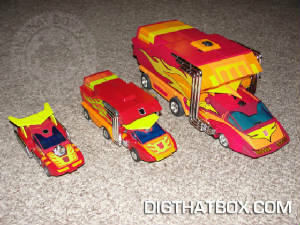 The Rodimus Convoy's vehicle mode feels like a cheat, but an effective cheat. 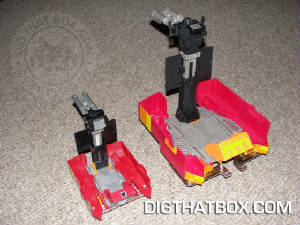 US Customers will love the car mode and two robots, but I still feel having the import's trailer is worth the extra cash even with its faults. If you have the money, definitely consider purchasing this piece.